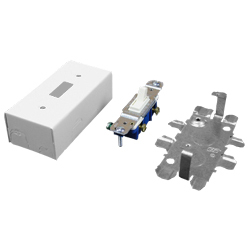 15A, 125V Single Pole Switch and Box Fitting accommodates other standard single-gang switches in place of furnished standard single pole switch. Cover has twistouts for Model # V500 or Model # V700 on each end. Twistout on ends permits running raceway close to interior trim. Base has 1/2" trade size KOs.